Overview: The Pune Maternal Nutrition Study (PMNS) is led by Dr Chittaranjan S Yajnik (Insert image A), Diabetes Research Unit, KEM Hospital, Pune. The cohort was set up prospectively in 1994 in six villages near Pune city. At that time, people’s main livelihood was subsistence agriculture. Since the area was drought-prone and lacked irrigation, malnutrition was common. The women recruited to the PMNS (F0 generation) were undernourished and did heavy farming work even when pregnant. Their children (the PMNS Cohort, F1 generation) have been followed up continuously by Dr Yajnik’s team and have participated in several in-depth studies of body composition and cardiometabolic risk factors. They are now aged 24 years. The PMNS study area has undergone marked socio-economic transition and urbanisation since 1994, with the introduction of irrigation, and the start-up of several small industries. Objective: To objective of the original cohort study was to explore associations of maternal diet, physical activity and nutritional status with birth outcomes and the evolution of cardiometabolic risk in the children. 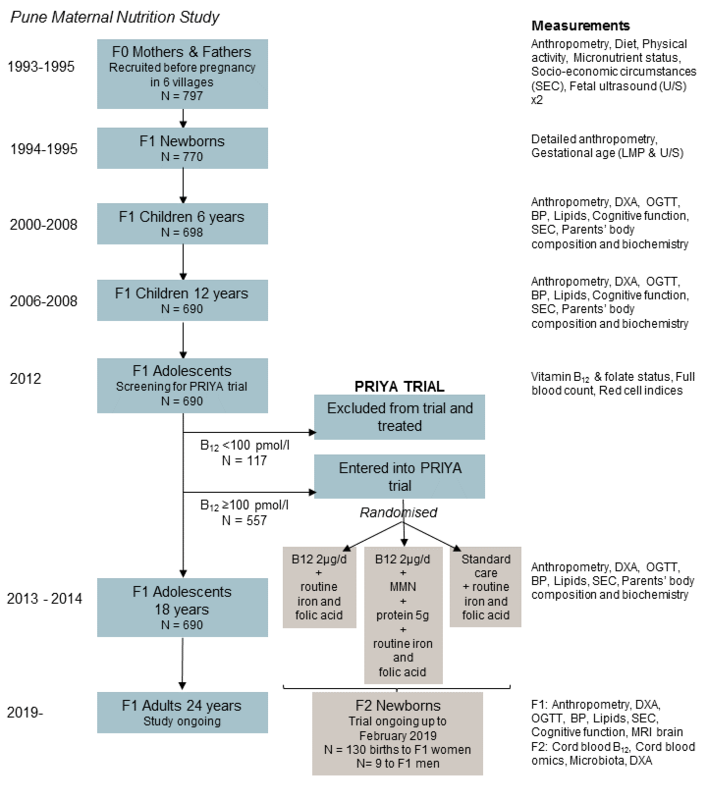 Since 2012, when the cohort was aged ~18 years, this cohort study has become a randomised controlled trial, testing the effect of vitamin B12 supplementation of the young F1 men and women on fetal growth, epigenetic marks and cardiometabolic outcomes in the next (F2) generation. Methods: In the initial study, women’s pre-pregnancy anthropometry was measured, and serial data on their diet and micronutrient status were collected during pregnancy. Fetal growth was measured by ultrasound and detailed anthropometry was carried out at birth and annually during childhood (N=702). At 6, 12, 18 and 24 years, body composition, cardiometabolic risk factors and cognitive function have been measured in the children and parents. One of the main early findings of PMNS was that 70% of the F0 mothers were vitamin B12 deficient during pregnancy, and that this was associated with increased insulin resistance in the F1 children. This, and other evidence, led to the decision to convert the PMNS cohort into an intervention study (“PRIYA”) in 2012. The F1 ‘children’ had reached the age when they were beginning to marry and have their own children, and after excluding and treating individuals with B12 deficiency, were enrolled in a study to test the impact of B12 supplementation, with and without additional micronutrients, on newborn B12 status and DNA methylation, and childhood cardiometabolic risk in the next generation. The study will examine changes in DNA methylation as a potential mechanism linking supplementation with outcomes. The PRIYA trial and the 24-year follow-up of the PMNS, are ongoing. At the last completed round of cardiometabolic risk marker measurements (aged 18 years), 28% of the young men and women had abnormal glucose tolerance (either impaired glucose tolerance of impaired fasting glucose). Glucose concentrations were higher in individuals whose birth weight had been lower. There was tracking of glucose values from early childhood.